Along with RB Christine Michael, TE Jimmy Graham signaled he’s ready to compete for comeback story of the year with six catches and 100 yards in Sunday’s triumph. Now that Christine Michael is the starting running back for the immediate future — a cracked fibula has sidelined starter Thomas Rawls for several games — the Seahawks are more than eager to welcome back another man of mystery. TE Jimmy Graham’s six catches for 100 yards Sunday in the 37-18 triumph over San Francisco were every bit as significant as the career-high 106 yards rushing by Michael, his competition for comeback story of the year. The odds against a full return from patellar tendon knee surgery in December were high. And since Graham hasn’t played a full season, the story isn’t over. But coach Pete Carroll was sufficiently impressed Sunday to flirt with an early conclusion. Carroll said that practice last week was a culmination of heavy work paying off between Graham and QB Russell Wilson. Making the tight end a pass-catching threat again was a big part of a balanced offense Sunday that had 31 rushing attempts and 32 passing attempts. Having to account for Graham often means pulling a defender out of the box. Last season, when Graham was beginning to integrate, he went down against Pittsburgh Nov. 29. Graham didn’t begin jogging until June. “Chemistry takes time; it’s not an automatic thing,” Carroll said. “Last year before the injury, we could see the potential, but never really felt the connection. It’s obvious now. Not anybody’s fault. Carroll chided some of the demands by fans and media to target Graham more. WR Doug Baldwin had a big day with eight receptions on 10 targets for a career-high 164 yards. Graham’s nine targets were “a nice mix,” Carroll said, especially in view of the fact that WR Tyler Lockett had a sore knee that meant he wasn’t targeted at all. In an interview Monday on ESPN 710, Graham said he still isn’t 100 percent. “For me, no,” Graham said. “My knee is getting stronger and stronger. Every morning, I’m still up and I’m still in here working as hard as I can to build strength, to get even more explosion back and to get more of my power back, which still isn’t there. Graham said he’s not interested in half-measures. “I’m not gonna be out there halfway tippy-toeing,” he said. “I’m not gonna kind of stick my toe in the water and see if it’s cold. Graham’s production may be even more relevant Sunday in New York. In a 24-3 loss to Kansas City, the Jets (1-2) defense permitted Chiefs TE Travis Kelce six catches for a team-high 89 yards and their only offensive touchdown. The Chiefs were aided greatly by eight Jets turnovers, including six interceptions of QB Ryan Fitzpatrick, one shy of tying the NFL single-game record. Carroll offered no more medical updates on Russell Wilson than he had in the morning. 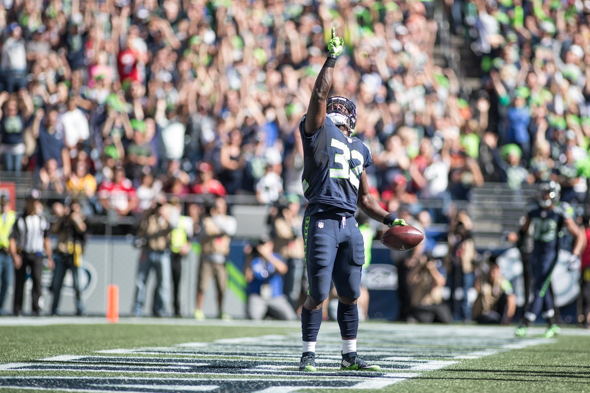 Regarding Rawls, he said, “The doctors were able to find something in there that wasn’t clear a week ago. It makes sense for how uncomfortable he’s feeling. He’s got a crack in there. Carroll indicated that the returns of two rookie draftees, RG Germain Ifedi and TE Nick Vannett, was also likely. I remember when Warren Moon said he was fit to start and unfortunately I don’t think he was and it cost us some games. I understand not wanting to step aside but somebody has to be the adult in the room. Wilson will never admit he’s not ready to go in. I have no reason to not trust Wilson or Carroll but I’m still worried. The Jets defense will be out to get him. I hope I’m worried for nothing and Wilson lights them up. Go Hawks. this knee injury is pretty common and guys play with it all the time. But most of the who play with this injury, which includes a brace, don’t require speed to do their jobs well. I think Carroll has the helm. It’s not the first time he’s coachd an ultra-competitive QB.